When we need some feedback from microcontroller usually we use USART. It allows to output messages, debug information to terminal screen. Also data can be sent to MCU same way. For this purpose STM32 microcontrollers have more than one USART interface allowing to have multiple streams of data output and input. USART interface is designed to be very versatile allowing to have lots of modes including LIN, IrDA, Smart card emulation, DMA based transmissions. But for now lets focus on standard USART communications we we could send and receive messages from terminal window. 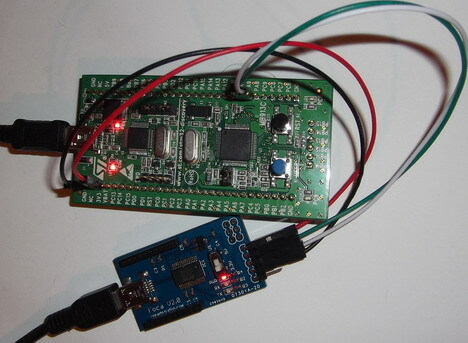 STM32F100RB microcontroller in Discovery board has three USARTs (USART1, USART2 and USART3). Other higher level STM32 microcontrollers have even more. USART1 is connected to APB2 bus while other USART’s are located on APB1. Every USART has a two DMA channels allowing data transfer between memory and Rx/Tx. Each USART has ten interrupt sources and all are mapped to same NVIC channel. So it is up to code to find out what triggered an interrupt. This is done by identifying flag in status register. Why don’t we take a real example and see how things work. For this we are going to program USART1 in our STM32VLDiscovery board. Discovery board only comes with naked pins that we have to connect to USART level converter like RS232 or USB. For this example we are going to use widely acceptable FT232RL based TTL to USB converter. 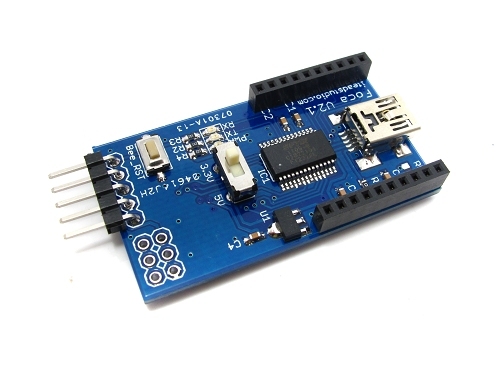 The FT232RL is a USB to serial UART interface with optional clock generator output. It’s the essential tools for establishing communication between PC and mostly MCU. We call them Usart1Put and Usart1Get functions that sends and receives data bytes. You can see in both functions that it is important to wait for transmission complete before sending next byte or storing received data. While loops simply check for proper flags to be set. simply speaking you can direct streams where ever you want (LCD, SPI, I2C, etc.) by putting send/receive byte functions here. In the next part we will be dealing with interrupt based buffered communications.